Looking to save significantly off one of the hottest chairs on the market? 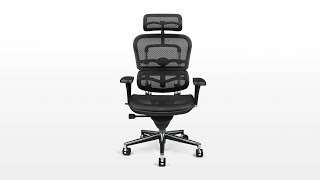 Consider an open box Raynor Ergohuman ME7ERG mesh chair with a headrest. THS occasionally receives returns to our warehouse, so these units are new chairs and fully covered by warranty. Most chairs are in perfect condition but some may have minor cosmetic blemishes. Call us (800-531-3746 option 1) and we'll let you know what we have available and pricing. Breathable mesh back makes this a must-have seat for users working in warm or humid environments, and delivers an alluring combination of style and comfort in a single package. Full information is available on our regular listing for the Ergohuman ME7ERG chair. Available inventory on repacks change regularly. This item only ships to the Contiguous US. Please note, this item can not be combined with other sale offers. This chair complies with ANSI/BIFMA standards.